A recipe for Apricot Fizz, a cocktail made with apricot liqueur and sparkling wine. It is a fruity, fizzy beverage for celebrations throughout the year. 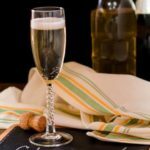 Pour the Apricardamom (or apricot brandy) in a flute glass and fill the glass with sparkling wine.